Five days of colt starting and horsemanship. Participants bring a colt to start and an older horse for horsemanship — cow working. We live in beautiful north eastern California which affords us many different types of terrain to ride as well as arena exposure. We have creeks to cross, hills to climb, cattle to work, trailer loading, any horse activity or problems you might want to address. Colts will get a good solid five day beginning. Horse and horsemanship riders will have exposure to all types of problem solving opportunities as well as refinement in horsemanship and cow working experience. Our home clinics have a limited number of participants to insure personal attention for all those involved. We accept 8 riders and no spectators. 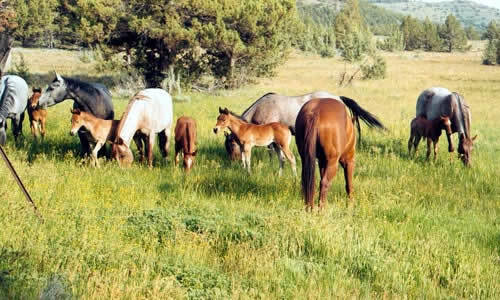 We board and feed your horses as well as feed you a great midday meal and a barbecue on Saturday night. We have saddle fitting and saddle building talks by local artisans. Lots of fun, fellowship and information are on the agenda for these days. Self-contained camping is available next to our creek. Several motels, as well as camp grounds with shower and laundry facilities are available in Alturas, 10 miles from the ranch. We are located 10 miles east of Alturas, California in Modoc county. Alturas is approximately 3 1/2 hours north of Reno, Nevada, which has an international airport, or 3 hours east of Redding, California or 2 hours south and east of Klamath Falls, Oregon or west and south of Winnemucca, Nevada approximately 5 hours. Call or write for your clinic reservation or we can send you a brochure with the details.